Here we go, a very cold, late winter is giving way to a warm spring! We are getting help from family and friends to keep up with the running maple sap. It is a great time of year and the rewards are SWEET! The boiling is going well. It takes awhile because we do it the old-fashioned way. We don’t take out water by reverse osmosis, we collect in bags, not tubing stretched all over the woods, we boil over a wood fire…all these factors (in my opinion) enhance the final product with an extra flavor molecule…. In the way of my grandpa, I continue..I think it’s worth it. After a nice freeze, the sap ran again! The season continues and that for me, is a happy thing. I spent much of yesterday cleaning and making ready for what is left of the season. The pans are sparkling. I am amazed at just how much work this “fun” of mine can be. I was soaked from the cleaning. Apparently I need more practice with a mop, broom , brushes, sponges and a water hose, especially that doggone hose! It was worth the effort to clean everything. It will be like the start of the season. Our syrup has been nice and light so far this year. I want to give myself every advantage to keep it that way. It may not make a difference, but at least I can say that I tried. 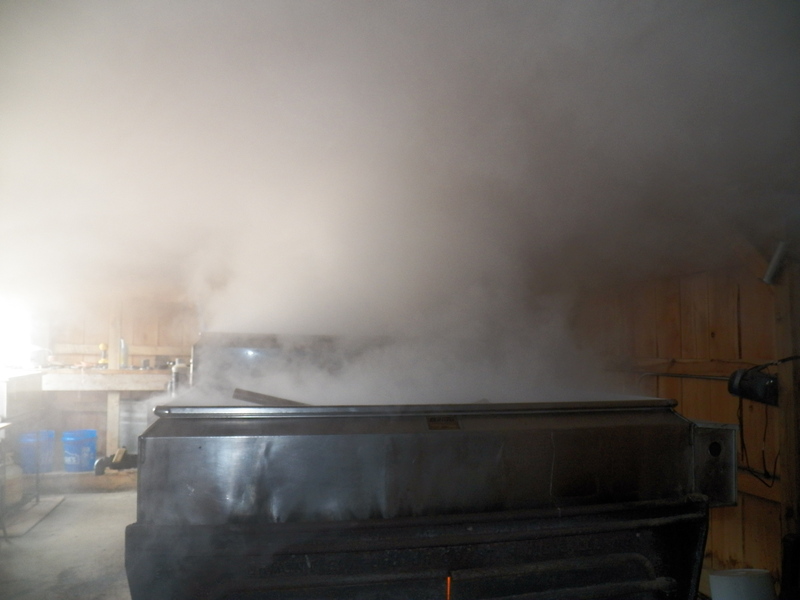 We completed our sixth boil of the maple season yesterday evening. It has been a great year for us so far. The sap is not very sweet, so it takes a lot of it to make a gallon of syrup. This year’s syrup has been light and creamy tasting. The ratio is closer to 65:1 , than our usual 40:1, but it is still worth the effort to me. The weatherman say we are in for a warm up. Lots of folks are giving up for the season. I am not one of them. I did chase the pans with water and will do a mid-season clean up tomorrow. The pans and all equipment will be drained, cleaned, rinsed and made ready for what I hope will be the next run. It’s only early March and the trees know. A few warm days will tease them just like us, but it’s not time to start gardening yet! As I write, the thermometer just dipped below freezing. It may not be cold enough to make the sap run, but it should remind the trees not to set buds yet. Next week looks cold and seasonable. So, with fingers crossed and plenty of wood in the woodshed, I will wait and hope for more maple sap. Just to help things turn cold, the horses and I will start plowing. That almost always makes for a good freeze. It’s like washing your car, no sooner you get started and the rain starts to fall. The warm days and cool evenings makes for pleasant plowing. The horses ease into spring work while shedding their winter coats. I get to work the horses while the greedy maple trees hold their sap. Last June, when we got 19 days of rain and cool temperatures, the trees could not get enough sunshine to make sugar and send the nutrients to their roots. Now, when we want the sweet juice bound for the treetops, we are reminded of the rainy days of last year and trying to make hay. The season will be what it is and I can speak all about how it went much better in a few weeks. For now I will enjoy the nice days and continue to do farm work being ever ready to jump back into the sugarbush. It has been awesome so far. I will be satisfied with our success, thankful for the memories and happy as a little boy as I breathe the sweet steam. This was my view for most of the day yesterday. This was taken after our first trip through the maple woods. By the end of the day all of us were covered in mud and sweat. We ended up with 2160 gallons of the maple sap that becomes pure Ohio maple syrup. I even had to boil for a few hours last night to get all the sap to our inside tank. I shutdown at midnight. Connie and I were back in the sugarhouse by 9:00 this morning where we boiled and canned for another seven and a half hours. It was a great day filled with steam and visitors. We are tired but happy as we continue to make very nice light syrup. The horses got the day off, but watched us from the pasture. I think they even chuckled a time or two! We will gather again tomorrow for what may be our last time. Mother nature has decided to send us some warm unseasonable weather. The warm is nice, but we need the freezing nights to make good syrup. We will work as if the season will continue, but will do a whole bunch of clean up just in case our season is at its end. The trees are dripping yet this afternoon, but have slowed down considerably. Yesterday, most of the bags were full or almost full. The horses pulled eight 210 gallon loads of sap using the new sled. I used three horses because it is hot, heavy work. They still have their winter coats on to boot. They were ready to be done as we brought the last load to be unloaded. I was very proud of my partners. They pulled willingly. They listened and they knew exactly where to put the sled to be unloaded. Yep, happy tired, describes us all today. The horses brought in 1680 gallons. We gathered 30 more gallons from trees around the sugarhouse by hand and a friend brought 450 gallons for us to boil as well. It was a good time boiling with the doors open on the sugarhouse, but man do I need a drink of water! Keeping up with a roaring fire, feeding that fire every five minutes, while running the evaporator, makes for a busy day!